Jn. 13:3 says, "Jesus, knowing that the Father had given all things into his hands, and that he had come from God and was going back to God..." That is, Jesus is in control of everything in the world, was an emissary of God (in fact, he knew himself to be God incarnate), and would soon return to God. Nothing could challenge any of that. The next verses should be something about massive self-glorification through overwhelming power. But of course, the next verses are about the Son of God stooping to the dirty feet of sinful men. He "loved them to the end" says the Fourth Evangelist. Such subversive and willful self-shaming can only be chocked up to the Father's will. Our Lord insists, after all, that he only does what he hears from the Father (8:29; 15:10). So also his confidence that he was from God and would soon return to Him appear to have been determinative. 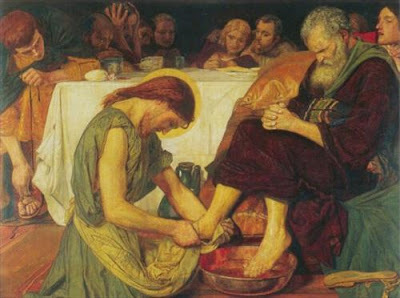 Unconditional obedience to the Father's will and confidence in his promises led to Jesus doing a job too humble even for most slaves so that his disciples would know his love for them. We talk so much about strategies for becoming missional Christians. Our mission includes loving the destitute and making disciples of all nations. These two will often go hand in hand, and I am grateful for the groundswell in American Christianity that is saying, "What must we do to lead the lost to Jesus? What must we do to love the widows and orphans and poor?" We ask these questions, and we strategize in response. Strategizing is necessary at times, but it also can too easily complicate simple matters. If we are to follow the example of our Lord and stoop down to the dirty places to show his love (and we must follow his example), then perhaps we need simply to meditate on who we are in Christ ("knowing that he had come from God"), on our unassailable hope ("and was going back to God"), and on the demands that God places on His followers ("my food is to do the will of him who sent me"). I suggest that if we will do these things, then we will feel the unencumbered freedom that is felt by those who are confident in the living God and His promises. It is faith and hope that will encourage love (cf. Col. 1:4-5 where the links are similar). And of course, we can only find these things in the Word of God. The Word of God must be our daily supply, and we must drink from it constantly. After watching David Platt's SBC conference sermon and reading the CT interview with him, I have been convicted about how little I actually care about the Bible- how little almost anyone I know cares about the Bible. The Word of God is all we have to offer to anyone. Platt is most certainly right about that. If we will immerse ourselves in it, and if we will do that in community, then we will be missional. That is, we will, go to the hard, messy places with the glorious love of Christ no matter what the cost. If you can't get excited about that, you need to repent.